Before I say anything else, I would like to reiterate that I love Bomberman, and although I am about to slam some of its games, this is not indicative of my opinion of the franchise as a whole. It’s not even really my opinion of the individual games I’ll be discussing here. However, even great works are subject to scrutiny, and, well… Bomberman has a whole lot to scrutinize. There have been so many games over the years, and so many interesting ideas thrown out in each title (well, up until the early 2000’s, anyway) that there were bound to be some mistakes here and there. Some of these mistakes came in the form of really weak bosses. Proof that good character design means little in the face of bad AI. Water Commander looks pretty badass. 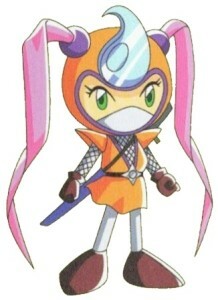 She’s dressed up in this cool ninja-esque attire, complete with a katana on her back. You can almost imagine those ribbons on her helmet fluttering in the wind as she slashes some dude in twain. Or at least, I can. Unfortunately, her katana is just for show, and so is her flashy appearance. I really wanted to like Water Commander the first time I saw her. I really did. 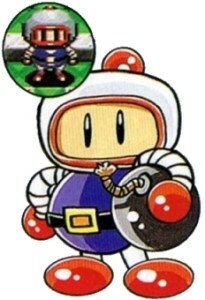 But make no mistake, this is one of the most inept villains ever faced in a Bomberman game. 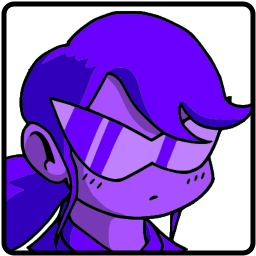 Even her personality is the same stock, recycled profile of an unfortunate number of female Bomberman characters. “As amusing as this may be, can we have female villains who aren’t flat and flirtateous stereotypes?” – me speaking to the corpse of Hudson Soft. In the Bomberman Quest Official Guidebook, the recommended strategy against Water Commander is to place a Normal Bomb and use the Yo-Yo to push it toward her. This causes her spray attack to miss your bombs, and allows you to actually damage her. Without the Yo-Yo, it’s difficult to routinely deal damage to Water Commander with your own bombs because she’s constantly spraying them into oblivion. This isn’t a problem, though, because she’ll almost certainly end up killing herself with her own attacks. If you didn’t watch that video, here’s what happened: Water Commander had six hit points. I took two of them away by using an effective strategy. The other four hit points were lost because she blasted herself with her own bombs. That means that 2/3 of the total damage she took during the whole battle was due to her own attacks, and I didn’t even have to do anything except not be an idiot and mess around in the line of fire. I didn’t even have to strategize beyond hiding behind a pillar every now and then. I, and many others, could defeat this boss without issuing a single attack. Not only is Water Commander vulnerable during the entire battle, but the timing of her bombs is such that it’s incredibly common for them to detonate by the time they’ve bounced back to her. Maybe with better timing, this could have been mitigated during development somewhat. Or maybe she could have, I don’t know, jumped to avoid the blasts of her own bombs. Or maybe, just maybe, she could have had a movement pattern that wasn’t so random that it forced her to turn around 180 degrees and walk right back into the newly-created explosion of her own bomb. If you didn’t catch that, go back and watch the video again. That took her last hit point away. It’s fine to have a boss that is supposed to be damaged with its own attacks by redirecting them or otherwise using them against the boss, or to have a boss that is so chaotic that it can be hit by its own attacks. I also completely understand that the first boss of a game is generally going to be much easier than the rest, just to get the player acclimated. However, having a boss that can be defeated by just standing around and idly watching it kill itself is never good design unless you’re intentionally trying to make the whole event into a farce. Yes, all four of them. Yes, this entry is actually four bosses rolled into one. This seems fair as they all share modified versions of the same AI. 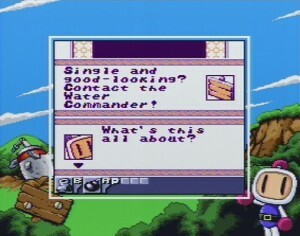 Back in the Super Famicom era, Bomberman was just beginning to toy around with unique Bomber villains. The first to come were the 5 Bad Bombers. Their AI was rather lazily designed – they simply moved toward the player and placed bombs, and the only differences were in their speeds, bomb powers, and unique bomb types. That was back in Super Bomberman 2. We didn’t get any new Bomber-versus-Bomber duels until Super Bomberman 4. You’d have thought that Hudson Soft would have improved upon their ideas for these types of battles. If you’d thought that, you couldn’t have been any more wrong. Now, I like the Bomber Shitennou. They have really interesting designs, and their new special abilities brought a much-needed, fresh twist on the classic Battle Game formula. You could choose Hammer Bomber and stun your enemies with a morning star (or a, er, “hammer”, as all the official documentation calls it), or you could choose Bazooka Bomber and blast your foes away with… well, with a bazooka. So, given that these were the bad guys, their equivalent boss forms in the Normal Game should have been pretty epic, right? I intentionally chose to start off with no power-ups, and I only collected a few in the arenas – the arenas were designed to offer them to you anyway, and I wanted to demonstrate how the game plays if you’re just busting through normally. The first thing you should notice is that each boss has a weird habit of walking a few steps and then stopping for a while. I really want to know why this is, but I don’t. I assume that they’re pausing to calculate a new action or destination, but the pause is really unnecessary and just makes them behave like idiots. It also makes them fairly easy to trap. I mean, come on… even most normal monsters in the game don’t stand around in the middle of the field. Hammer Bomber – Dicked around a lot and got trapped in bombs because he moved too slowly and paused a lot. His hammer can screw you up if you’re not careful and you’re already standing by a bomb, because you’ll be stunned for a moment, but other than that, he behaves like a parent trying to play nice in order to ease you into the game. It should be unnecessary at this point, even though it’s the first boss. Jet Bomber – He kept getting locked into the pattern of using his jet attack, which is easily blockable by placing a bomb and getting out of there. With the right timing, you can even hurt him by doing this. I must admit that his avoidance strategies were fairly intelligent, but all they served to do was draw the fight out longer because he wasn’t even making an attempt to attack. He was almost too cautious. Lady Bomber – Like Hammer Bomber, she crumbled in close quarters. She just kept getting trapped between two bombs. It’s hard to get trapped between two bombs unless you just aren’t that good at Bomberman, or if your opponent is overpowered and/or far outranks you. I had multiple bombs, but she was trapping herself between one of my bombs and one of her own bombs. That’s just inexcusable for a boss that lies right in the middle of the game. Bazooka Bomber – He’s made marginally more interesting because he moves a bit faster and likes to kick bombs around. Like Jet Bomber, his bazooka ability is easily blockable, but unlike Jet Bomber you can’t rely on the same technique to try to damage him when he uses it. I suppose you could get close and wrap bombs around him, but it’s not necessary. Just like the others, he died by making dumb mistakes, but, unlike the others, most of the time he kept damaging himself with his own bombs. It’s probably because his firepower was higher and his AI just wasn’t strong enough to deal with that. At least he’s somewhat challenging if you’re not on your toes, or if you’re a novice player, perhaps. You’ll notice that I left out the final Bomber-versus-Bomber duel against Great Bomber, both because he is not a member of the Shitennou (they are not a gotennou, after all), and because he has a slew of power-ups, can temporarily become invincible, and is pretty aggressive. That last point is what I keep thinking about the more I consider what’s wrong with the rest of thes bosses. They’re just not aggressive. I’m supposed to be battling bad guys who are trying to alter history. It shouldn’t feel like they’re going easy on me. Sure, it’s lazy, but a giant Bomberman? It could have worked. So you blast your way through the fourth world of Super Bomberman 2 and you’re confronted with the vicious, cold-hearted Brain Bomber, rumoured to be the inventor of the Remote Control bomb detonation device. You know, that thing that you abuse in order to break pretty much every Bomberman game. I’m not actually making that up; it’s in the Super Bomberman 2 Official Guidebook, though since it only appears in the manga, and the manga differs substantially from the story presented in the manual, you could take it with a grain of salt. Picture courtesy of a 20-year-old guidebook. Brain Bomber would eventually redeem himself in Super Bomberman 3 and Bomberman Story by actually being as dangerous as he’s supposed to be, but this first outing was just sad all around.